I received this e-Arc from NetGalley and Grand Central Publishing in exchange for an honest review. Synopsis: A secret chamber. A mysterious shipwreck. A murder in the desolate salt marshes. A seemingly straightforward private case turns out to be much more complicated-and-sinister-than Special Agent A.X.L. Pendergast ever could have anticipated. Pendergast and Constance soon learn that Exmouth is a town with a very dark and troubled history, and this skeleton may be only the first hint of an ancient transgression, kept secret all these years. But they will discover that the sins of the past are still very much alive. I’ve been fascinated with Aloysius X. L. Pendergast since he first appeared as a secondary character in Relic (1995). Fifteen books later, his story still has the power to mesmerize me. Except for a rather strange segue into the supernatural near the end of the book, Crimson Shore is an enjoyable mystery which kept me reading well into the night. Having fully recovered from the events in Blue Labyrinth, Pendergast’s Holmesian talents of deduction are on full display here, as are his eccentricities. While there aren’t any new revelations as have been in previous books, his relationship with his ward Constance, does move forward, albeit awkwardly at times. Theirs is a curious dance which manages to be both sad and amusing. These are two people whose I.Q.s are off the charts, yet when it comes to relationships they’re incredibly naive. Constance continues to grow in this story and it’s becoming evident that she will ultimately become a worthy partner for Pendergast both in their investigative endeavors as well as their personal lives. I do wish she was a little more empathetic towards other people as this would provide some balance towards Pendergast’s aloofness, but given her background and the traumas she’s suffered it’s understandable why her personality mirrors that of her mentor’s. While supernatural themes have appeared more than once in this series, this time it seemed to be tacked on near the end of the book, almost as an afterthought. Even worse, it actually could have worked if Preston and Child had integrated it more fully with the rest of the story. Instead it’s tacked on near the end and frankly left me wondering why. The book ends with an explosive cliffhanger which has left me frustrated as it will most likely be another year before the next book comes out. Personally, I’m not a fan of endings like these, as they tend to make me feel as though I’m being manipulated. 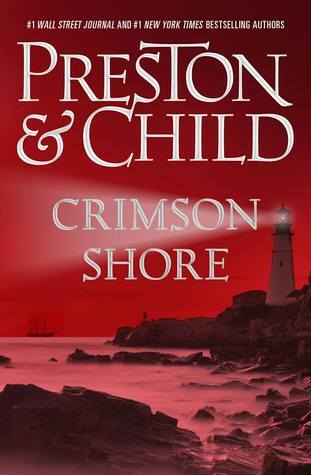 Despite it’s flaws, Crimson Shore is still an intriguing mystery which combines many elements including: Massachusett’ s maritime history, the Salem Witchcraft Trials, and even a nod to Poe. While it’s not my favorite Pendergast novel, it’s still has left me anxiously awaiting the next installment. I follow all of their books too, but unlike you, I was not a fan of Pendergast from the beginning. My very favorite was the journalist Smithback with D’Agosta next. But even when I didn’t like Pendergast personally, I loved the books. I only began to warm up to him after many books and finally actually liked him in White Fire after he was so good to Corrie (who I didn’t like when I met her in Still Life with Crows). It does look like the guys are leaning toward sequels and trilogies. It’s funny because I didn’t exactly “like” him at first. For me he was just one of those characters that took on a life of his own. I did like Smithback though, and Vinnie is anther favorite of mine. LOL, yes, he definitely did take on a life of his own. Good description of him. When I read Relic I thought it was the best book I read all year and possibly the entire decade. I was surprised when it was Pendergast that went on to be the lead character in the series. Sounds quite intriguing and slightly spooky. On another note, I’ve been catching up with White Collar, damn it is one slick show and Neal Caffrey is such a cool cat. Id only caught parts of it before but now I’m invested in it and love it. Plus it just reaffirms my man crush on Matt Bomer. Another fan of White Collar. Indeed I am, nice to meet you. And I’ve just started following your wonderful blog, I hope mine proves enjoyable for you. Thanks, Vinnie. I’ll check out your blog too. How many Pendergast reviews have u done, Kim?